Nivea brings the goodness of premium natural oils in a fast absorbing lotion with sensual fragrances. Treat your senses and get the indulgent care and all the benefits of an oil, but in the form of a fast absorbing lotion, with the Nivea Oil in Lotion Rose & Argan Oil range. Explore the entire range of Lotions & Creams available on Nykaa. Shop more Nivea products here.Alternatively, you can also find many more products from the Nivea Oil In Lotion Rose & Argan Oil range. Explore the entire range of Lotions & Creams available on Nykaa. 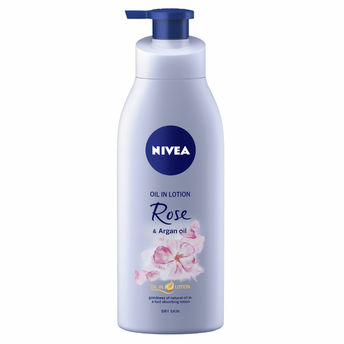 Shop more Nivea products here.You can browse through the complete world of Nivea Lotions & Creams .Alternatively, you can also find many more products from the Nivea Oil In Lotion Rose & Argan Oil range.